Setting the standard in safe, effective laser hair removal, the Candela GentleLASE is one the staples in the aesthetic laser community. The innovative GentleLASE is Candela’s premiere hair removal laser; it treats patients quickly, effectively and comfortable. The causes and treatments for unwanted hair are abundant, and each year more laser companies boast being the ‘best new avenue for removal of unwanted hair’. So, why does the GentleLASE stand out among the rest? This ground-breaking machine, with the largest spot size and fastest repetition rate currently available to the aesthetic laser community, has the capability to treat patients faster and more effectively than any other aesthetic laser machine out there. One of the reasons why the GentleLASE is the most widely used laser hair removal system on the market today is because it employs the patented Dynamic Cooling Device (DCD). This device is unique to Candela lasers; no other hair removal laser has it. The DCD is in place to make treatments more comfortable by cooling and protecting the outer layers of skin against thermal injury. With its unique cooling device in addition to all its other features, the Candela GentleLASE is one of the safest and most effective aesthetic lasers used today. The GentleMax, Candela’s newly integrated multi-wavelength aesthetic laser treatment system, has taken aesthetic laser procedures to an entirely new level. By combining the capabilities of two of Candela’s premiere lasers, the GentleLASE and GentleYAG, into one complete system, the GentleMax now treats all patients for a variety of skin and hair ailments. This innovative technology features both the 755nm and the 1064nm wavelengths; therefore, it is capable of providing permanent hair reduction for patients with all skin types; including tanned skin. In addition to hair removal, the GentleMax can also be utilized for other aesthetic laser treatments such as skin rejuvenation, facial and leg vein treatments, skin tightening, wrinkle reduction and the removal of pigmented lesions. The GentleMax now allows one laser device to do the work of two, efficiently and effectively. This evolution in aesthetic laser treatment devices offers patients faster, more effective laser treatment experiences no matter what they are treating. This revolutionary laser can be used to safely and effectively treat a variety of skin conditions so for those individuals who are looking for safe, effective aesthetic laser treatments, the Candela GentleMax™ is the way to go. With spot sizes ranging from 1.5-mm through 18-mm, efficient and effective aesthetic laser treatments can be provided for a variety of conditions. While there may be other multiple wavelength systems currently available to consumers, none come close to matching the versatility of the Candela GentleMax. The fastest and most powerful: YAG laser on the aesthetic market today is none other than the GentleYAG by Candela. The GentleYAG offers unmatched treatment capabilities for hair reduction, skin tightening, wrinkle reduction, and leg and facial vein removal. 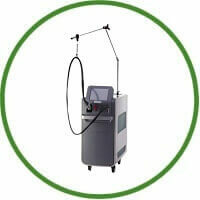 The GentleYAG is widely known as the fastest and most powerful: YAG laser currently available. With its larger spot size, faster repetition rate and longer wavelength, the GentleYAG® laser provides safe and effective treatments for all patients. In terms of speed, efficacy and versatility, the Candela GentleYAG is the number one laser for the job. Many clinics today utilize the Candela GentleYAG for a variety of treatments; however it is especially effective for the removal of unwanted hair. YAG laser is the most effective laser for treating those hair removal patients with darker skin tones. YAG laser by Candela operates at a longer wavelength than the Alexandrite or Diode laser; this allows the laser to pass safely through the outer layers of skin without causing thermal injury. When undergoing sessions with the Candela GentleYAG, whether for hair removal or any other aesthetic procedure, patients can feel confident that they are receiving safe and effective treatments that will provide lasting results.